Ok, so you’ve fallen in love with tiny homes. Now you are trying to decide if you should build or buy a tiny house. Where do you begin? What do you need to be aware of before making a life-changing decision? One huge difference between a self-built and pro-built tiny house is the cost. A builder will charge you anywhere between $30-100,000. Total cost depends on size, materials used and level of customization. Whereas, an average DIY build will run you between $15-35,000. Savings are significant when you are not paying for labor. Though, it will assuredly take much longer to build. A good compromise between the two options is a tiny house shell, which cost $15,000-35,000. The best part is that some of the most difficult aspects of your build done for you, while still allowing you to have hands-on experience and customization. Select models come with RV certification. Is building your own tiny house feasible? The feasibility of building your own home goes far beyond technical skills. You access to build location and tools–extra budget considerations. Additionally, you may require storage space for materials that you gather slowly before you kick off the actual build. Another great way to find both a building location and support during your build is by networking with local tiny house Meetup groups. A support group is crucial to the success of DIY builds. Trust me, you will get discouraged and overwhelmed. An extra set of hands or a little cheerleading can go a long way. Though, you can’t always count on help from others. If you don’t have the building skills, research and prep will make a huge difference if you don’t have the building skills. It takes time to learn! There are many great how-to resources, from books to building workshops (online and in-person), and of course, there’s always YouTube. Whatever you do, always be confident you are using a power tool correctly. Never rush–that’s how accidents happen. There definitely seems to be a wide range of tiny house prices from different builders. As mentioned above, this is largely due to material selection, size of house and amount of custom design work. The more customization, the higher the cost. Don’t rule out going with a stock model. The beauty of a tiny house is they can be modified and remodeled. You can always add customization, small or large, after the house is finished. 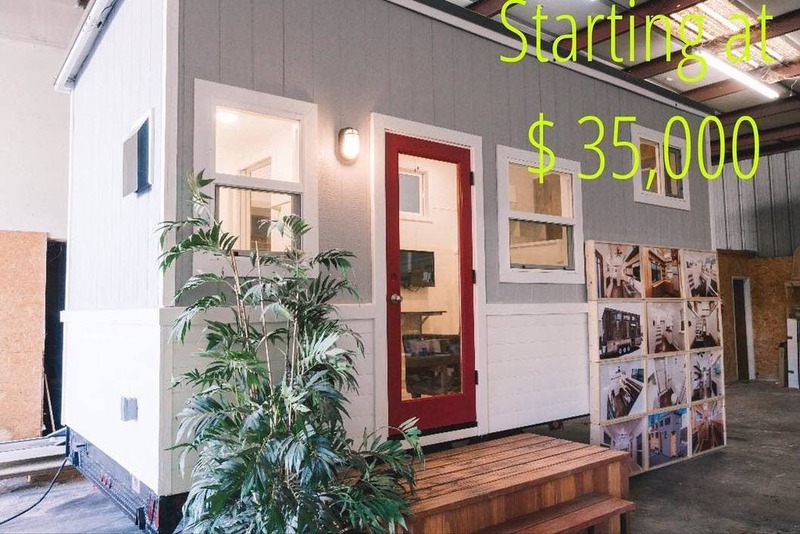 California Tiny House has an incredible $35,000, 18’ tiny house model. Smaller and less custom equals big cost savings, but it still a high-quality build and layout. Reach out to smaller shops willing to work around your budget, like Perch & Nest Tiny Home Company. They will let you know realistically what they the amount of customization they can for specific sized tiny houses, and how to save costs on different aspects. Though, it might take longer to get your house, because they work on less houses at the same time than large manufactuers, like Tumbleweed Tiny House Company. More importantly than final cost is legitimacy and quality of work. ALWAYS do your research before hiring a builder. Please don’t become another horror story. Too many people have been taken advantage of, and far too many people, have received dysfunctional tiny houses. My advice: get several customer references. Ask the builder for contacts. You can also check online reviews, but definitely take these with a grain of salt. Additionally, I recommend you look them up on the Better Business Bureau, the company and builder’s name. For more advice on how to choose a builder, read these posts–part 1 and part 2. Whether you go DIY or Pro, begin by identifying your needs and priorities. No matter what route you ultimately decide to go with you need to begin with some serious self-reflection. How tiny is right for you? Size is directly related to your lifestyle preferences. Maybe cooking is your passion. Therefore, you can’t imagine living without a stove. Ok, check. Now you know you need enough room for that, and you need to design around this treasured feature. Make a list of needs and wants. Compile a dream board of your favorite tiny house designs. This is where Pinterest comes in. Seeing online isn’t always enough. There’s no replacement for feeling the space in-person. Fortunately, there are more options than ever with the numerous tiny houses festivals and short-term rentals, across the country. There is no time like the present to make steps towards your tiny living dreams. Don’t let analysis paralysis keep you from moving forward. There’s is always something you can do to get you closer to achieving your goal. Start saving, and start researching! Struggling with financial hardship? Salvaged and reclaimed materials can save you hundreds or even thousands of dollars on a DIY builder. Additionally, look up Operation Tiny Home’s new Down Payment Assistance Grant. For more details, read this recent post. So do you want to buy or build your own tiny home? Let us know in the comments below.